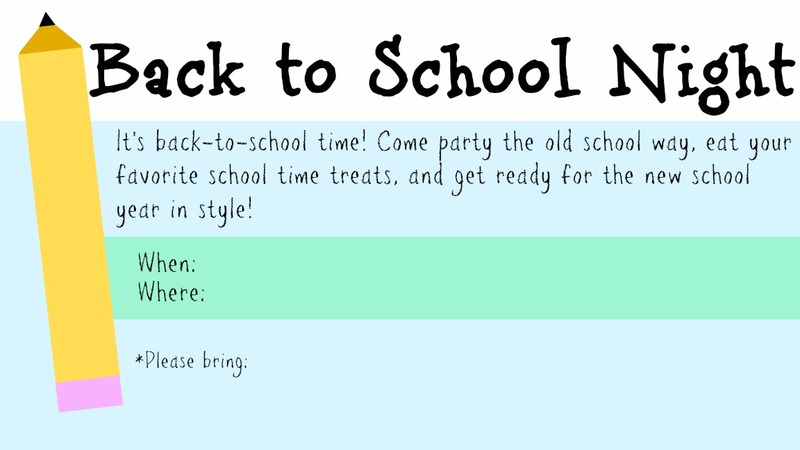 I was going to save this until later when I can actually share fun pictures of the party and more ideas about how to host a fun back-to-school party. But then I remembered that my attention span can be really short when it comes to posting what I'm working on and I decided I had better post these now while I'm thinking about it. I'm in a fun club called the Optometry Wives Club. It basically is what it sounds like. Each month we wives of the optometry students at my husbands' school get together and party like it's 1999. Last year we met for cookie swaps, craft nights, caramel apple making, picnics, and a number of other fun activities. Since a different member gets to host it each month, we're spoiled with a variety of great activities to take part in. Last month I headed up the opening social picnic/BBQ and I am happy to say that it was a total success. We all had a blast getting to know the new families just starting optometry school and catch up with our friends that have been gone all summer. That night I let people sign up for a month to host Optometry Wives and I was very excited/relieved to check the list at the end of the night and see that all of the months had been signed up for. I was off the hook for another year! The next day on the way to church Bryan and I were talking about the picnic and he said, "Oh yeah, did you mean to leave September off the list for people to sign up for?" Haha. No. Thanks, honey. One of my friends had told me ahead of time that she wanted to call dibs on hosting in October, so I got it in my head that October was the first month for people to sign up for and, in so doing, totally left September off the sign-up list. After trying (and failing*) to con some other people into hosting the Optometry Wives night this month, I decided to just take another turn and do it myself. Mostly I decided to go ahead and do it after I spotted this gorgeous picture of school supplies on You Are My Fave and was seized by the desire to throw a back to school party. Bryan: For the people with kids who are starting school? Me: No, for the wives. Bryan: The wives who are starting school? Me: No, none of us are starting school. 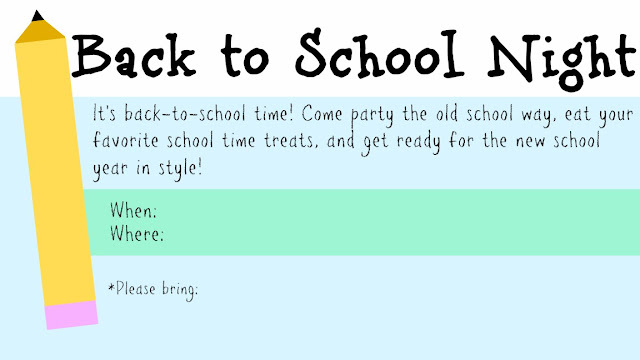 Me: It's really just going to be more of a back-to-school themed party. Bryan: Oh. Are you going to have those little cartons of milk? I wish. I've looked for them in stores and so far, nada. The closest thing I've found are some cute little orange juice boxes that come with some equally cute little straws. 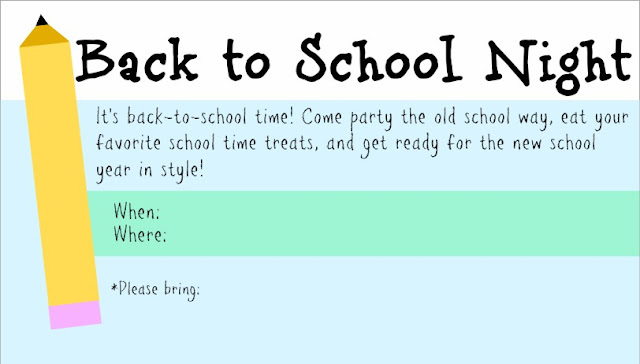 Also on the menu for the night are some crust-less PB&J's, string cheese, goldfish crackers, and other favorite school time treats. I may even spring for some Ho Hos and Ding Dongs. We'll just have to see how school spirited I'm feeling when I go grocery shopping for the par-tay. 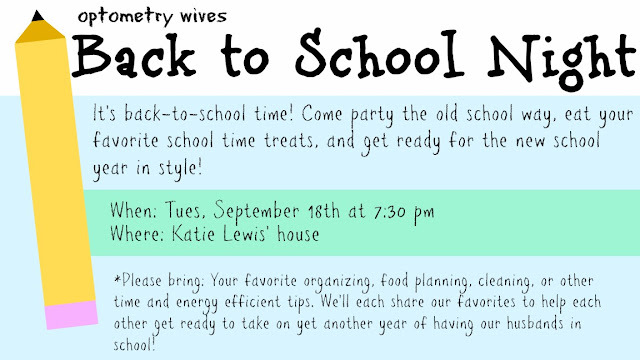 For our Optometry Wives back-to-school shindig this month I've also asked everyone who comes to bring their favorite tips for organizing, scheduling, mean planning, and/or cleaning. None of us are really in school anymore, but being the wife of a perpetual student** still takes a lot of work. And after some of us have had our husbands home all summer, having them back in school now takes some getting used to. Hopefully sharing our best tried-and-true tips will help us all keep it together throughout the school year. Anyway, today I wasted some time wisely took advantage of Olivia's nap time by creating these fun little printable invitations. The invitation (the one above that's all filled out) that I sent to everyone was actually one that I just e-mailed to the Optometry Wives group. With this group it's just plain easier and more efficient to send out an e-mail. But I thought it would also be fun to provide a little printable version for you that you can fill in with your own info. Just click HERE or on the image above to view and print the invitations. They print 2 per page. *One of my friends is actually helping me put this together. Thank goodness!